As humidity levels approached one hundred percent in Northland this morning, so too did levels of excitement ahead of the first day of racing in the Bay of Islands Sailing Week regatta. Setup for the Bay of Islands Sailing Week regatta - which starts with registration tomorrow, Tuesday 26th January - is underway, and according to regatta organisers, progressing very well. Yachting New Zealand has decided to change the format of the IRC Nationals being held at next week’s Bay of Islands Sailing Week regatta. Forget pigs - it'll be flying cats that take centre stage at the Bay of Islands Sailing Week regatta during the last week of January 2016. 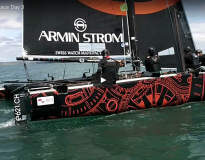 A new generation of super-fast flying catamarans is expected to launch the popular annual regatta into a new era of yacht racing. The 2016 Bay of Islands Sailing Week is shaping up to be an international affair, as the regatta's popularity continues to grow overseas.